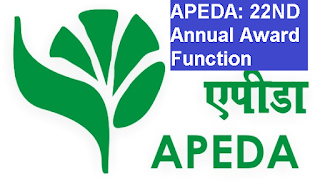 New Delhi: Agricultural and Processed Food Products Export Development Authority popularly known as APEDA is an apex body of the Ministry of Commerce, Government of India, to promote the export of agricultural commodities and processed food products. APEDA links Indian exporters to global markets besides providing comprehensive export oriented services. APEDA provides referral services and suggest suitable partners for joint ventures. APEDA’s export basket ranges from typically Indian ethnic products like pickles, chutneys, sauces, curries etc. to rice, honey, fresh and processed fruits and vegetables, beverages, guar gum, poultry, livestock products, confectionery, cut flowers, food grains, aromatic plants and other Indian delicacies. In order to felicitate the exporters for their distinguished service in exports of Indian Agro and Processed Food, 82 awards were presented for the years 2014-15 and 2015-16 in the following categories: Diamond - 2 Gold - 33 Silver – 29 Bronze – 18. Allanasons Ltd. got the “Diamond Trophy” for both years for their outstanding export performance and overall contribution in food sector. Awardees getting “Golden Trophy” for both the years include Ramesh Flowers (P) Ltd. (for Floriculture), Nandyala Satyanarayana (for Fresh Vegetables), Namdhari Seeds Private Limited (for Fruits & Vegetable Seeds), Al-Hamd Agro Food Products Pvt. Ltd. (For Buffalo Meat), SKM Egg Products Export (India) Ltd.(for Poultry Products), Gujarat Co-Op Milk Marketing Federation Ltd (for Dairy Products), Kejriwal Bee Care India Pvt. Ltd. (for Natural Honey), Jain Irrigation Systems Ltd. (for Processed Fruits & Vegetables), U.B. Global Ltd. (for Alcoholic Beverages), Hindustan Gum & Chemicals Ltd. (for Guar Gum) and Satyam Balajee Rice Industries Pvt. Ltd. (for Non-Basmati Rice). The awards were presented by Commerce Secretary Mrs Rita Teaotia. Congratulating the winners she said India has emerged as 7th largest exporter of agri-products globally and it goes to the credit of exporters who even in these times of economic slowdown have continued to grow. She said opportunities in newer markets have to be searched for further growth. The commerce secretary said APEDA is constantly in touch with the stakeholders and taking several measures for development of agro exports. APEDA in association with the concerned line Ministries is addressing issues relating to market access. She said it is very important to maintain traceability and accountability in value addition chain. The total merchandise exports during 2016-17 stood at 276.28 billion US$ out of which agri exports comprised of 33.38 billion US$ representing 12.08% of the total exports. There is a significant increase in the exports of food products from the country. Exports of food products monitored by APEDA during 2016-17 stood at 16.28 billion US$ (Rs.1,08,867.17 crore) representing 48.77% of Agri exports from the country. Vietnam, UAE, Saudi Arabia, USA, Iran, Iraq and Nepal are the major destinations for export of food products from India. Agricultural and Processed Food Products Export Development Authority popularly known as APEDA is an apex body of the Ministry of Commerce, Government of India, to promote the export of agricultural commodities and processed food products.